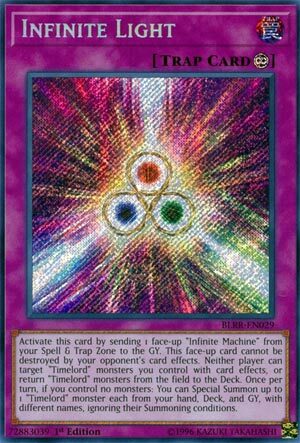 Activate by sending 1 face-up “Infinite Machine” in your Spell & Trap Zone to the GY. This face-up card cannot be destroyed by your opponent’s card effects. Neither player can target “Timelord” monsters you control with card effects,or return “Timelord” monsters from the field to the Deck. Once per turn, if you control no monsters: You can Special Summon up to 1 “Timelord” monster each from your hand, Deck, and GY, with different names, ignoring their Summoning conditions. Infinite Light has an awesome name that requires other traps. It’s a Continuous Trap Card that requires to have sent Empty Machine and then Infinite Machine to the grave in order to grant TimeLords targeting protection from either player. They also don’t have to return to the deck anymore. Infinite Light itself is protected from destruction effects. This has an offense/defense aspect because protection is good, but not having your monsters go back to the deck by their own effect is really good. In fact, Infinite Light didn’t need much more to be good, but requiring to other cards is a largish investment. So to make it even better, the free once per turn effect lets you summon 3 different TimeLords from the hand, grave, and deck ignoring their summoning conditions. This effect is great because there is no restriction on any other summoning or attacking. Sometimes boss cards cost too much and offer too little. This Trap should make you win the game, but it’s slow and requires other things to work. Still easier than FINAL and Exodia and still a great name. Next up we got the final bit of Timelord support from the anime this year, and today we will look at the final Continuous Trap of the archetype, Infinite Light. Infinite Light must be activated by sending an Infinite Machine you control to the GY, which in turn must be activated by sending Empty Machine you control to the GY so this is basically a three stage Trap with this being the final stage. This card cannot be destroyed by your opponent’s card effects. Nice protection, but I wish it had targeting protection as well so it wouldn’t fall to Castel or Cosmic Cyclone. Neither player can target Timelords you control with card effects or return them to the deck. This eliminates the effect the Timelords have to go back to the deck and covers their one weakness of targeting protection. Once per turn, if you control no monsters, you can Special Summon up to 1 Timelord each from your hand, deck, and GY with different names ignoring the summoning conditions. All the Timelords can’t be summoned from the deck, so the ignoring summoning conditions makes sense. This can help get you three Timelords immediately to do massive burn, clear the opponents board, and apply pressure to the opponent. Thankfully this doesn’t say 0 ATK otherwise Sandiaon cannot be summoned off this like how it can’t with Time Maiden. The only problem with this card is that you need to use two other Traps first, but at least those Traps help get the next stage to you easily. Infinite Light is an ok card that would of been a little broken if you didn’t have to use two other Traps first. Art: 4/5 It doesn’t look special, but I honestly like it. Next is a Continuous Trap, in the form of Infinite Light. So this Trap is in layers, so to speak, as to activate this, you have to send a face-up ‘Infinite Machine’ (which follows that Empty Machine card) so jump through your hoops, and finally you can activate this. What do you get? Well this card is invincible to your opponent’s card effects. That’s nice, after investing into this, you’d like some protection for it. Neither player is able to target your Timelord Monsters with card effects, or return them to the Deck. This is getting better on both fronts, especially the not cycling back to the Deck part. Once per turn, you also can summon three different Timelord Monsters (one each from your Hand, Deck, and Graveyard) with different names, so long as you control no Monsters at the time. Obviously and thankfully, you ignore their Summoning conditions, so another plus. You might get that effect off once, it’ll be harder than you think, but you wouldn’t ideally need it more than once. This card IS better than yesterday, and if you can get through the hurdles and bring it out, it’ll be an asset for sure, but it certainly isn’t broken or anything.